Preview your furniture in your home ! 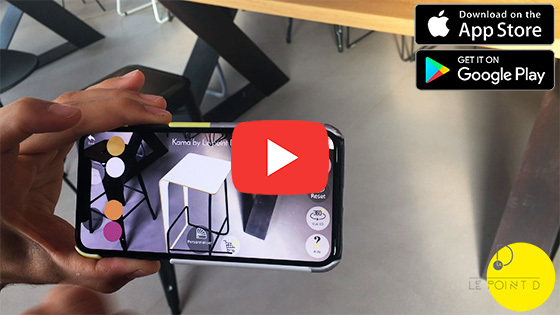 Augmented reality allows you to display a piece of furniture from our collection directly in your home: trying a furniture now becomes as obvious as trying a pair of glasses before buying it. Customization in live - change colors, materials immediatly ! Good choice guarantee - no more room for doubt ! Q: What devices are supported ? Our app works on Android smartphones and tablets and on the iPhone / iPad. For Android, the minimum version supported is version 4.0 (Ice Cream Sandwich). However, to take advantage of the augmented reality feature, your device must run on Android 6.0 (Marshmallow) or later, have a gyroscope and a selective stabilization of the image. For iPhones / iPad, the minimum supported version is iOS 9.0. Please note that the object displayed in augmented reality will be more stable with recent device. Q: I have heard that augmented reality apps may need a marquer. Is that the case for this app ? For objects on the ground (sofas, armchairs, tables, consoles ...), the application works without a marker. It scans the ground to detect a flat surface and then superimposes the object in 3D. For objects on the wall (shelves), it is necessary to print a marker (to download HERE) and then position it on the wall where you want the object to appear. The application will then detect this marker and display the object in 3D. 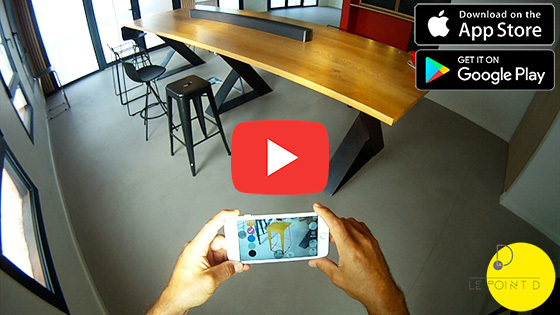 Q: I can not display furniture in augmented reality. The detection frame remains orange. What should I do ? - Be sure to be in a place with stable lighting conditions: moderate lighting, neither too dark nor too bright. Avoid glare and dark shadows. - For furniture on the floor (sofas, armchairs, tables, consoles ...), stand up with your device approximately 1.3m above the floor and in front of a flat and empty horizontal surface. For optimal ground detection, surface details help to reveal geometry and improve accuracy and performance. - For wall furniture, make sure to print the marker in A4 size. Q: My furniture seems to "fly" above the ground. What to do ? This behavior appears when the object displayed in augmented reality is not on an empty surface and is "superimposed" with real objects. To limit this undesirable effect, it is necessary to stand in front of a completely empty surface where you want to make the object appear in augmented reality. Q: I would like to use this technology for my company's products, is it possible ? Of course ! Please contact us directly (contact@lepointd.com) to study the solutions that we could offer you. Push the doors of our virtual showroom ! Discover our universe by walking through the different rooms of this virtual house. To move, click on the half-spheres highlighted. And to discover a product, nothing is simpler: click and hold the left button of your mouse pressed for a few seconds on the product of your choice.